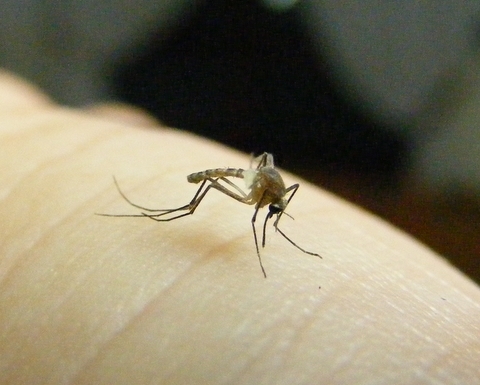 Mosquito season is back – big time! Secondly, there are the larger, blackish mozzies with striped legs, which bite more during the day, but do not give you malaria. 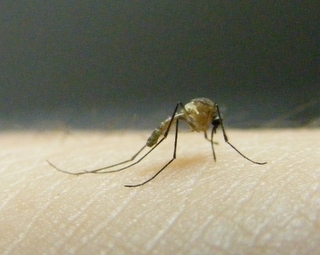 Instead, they can pass on dengue fever or yellow fever instead and their bites can be itchy. Nice! Just as well I am armed with my mosquito electrocuting racket at times such as these! If anyone reading this knows more about mosquitoes than me (not difficult) then leave a comment to enrich our knowledge on the matter! If not, then you can also click here for information on bites you can get in Africa (aka fast food for insects). Finally, don’t forget the Creepy Crawlies album in the Photo Gallery. A family photo…with a difference! Actually, this photo was taken at the Fondation Zinsou, Cotonou’s best (and only?) art gallery. The gallery is in Ganhi, not far from Notre Dame Cathedral. Entry is free and the whole place is air-conditioned. Also, there’s a nice (if slightly overpriced) tea room, which does tasty cakes and good tea (even Earl Grey). There were some interesting photos from Africa and other parts of the world on display when we went…and then there was the dressing up room! 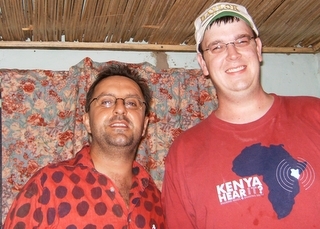 By the way, there is one extra person in our family in the photo above – anyone know who it is? Can you identify all five Bakers too?? Incidentally, if you’re looking for things to do in Benin, then I stumbled upon this site, which has some good ideas. Q: Who, in 1701, was inspired by looking at a church organ to go and invent the seed drill? Answer to last week’s question: The dolphin is the mammal with the most teeth. To be precise, the long-snouted spinner dolphin (which, incidentally, is neither a marsupial nor a monotreme!!). More spinner dolphin info here. Catching up with the Z’s! * Rob just got back from yet another trip up north, this time with Ben, a short-termer from the USA. 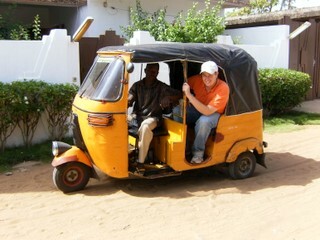 Read his first impressions of Togo/Benin on his blog. * We are beginning to sell our belongings, ready for our departure in July. * It’s rainy season and the streets are very wet. Q: There is one mammal which has more teeth than any other – up to 260 in fact. Which mammal is it? My two favourite renditions of ‘Somewhere over the Rainbow’ are by Eva Cassidy and Israel Kamawiwo’ole. The winner was the inimitable Tim Slade, but could’ve been Eddie Arthur! NB If you know any other good renditions of the song, let me know! There have, sadly been too many cases of people drowning or almost drowning of the coast of Benin during our time here. We were at Grand Popo a few weeks back and witnessed a polish lady very nearly drowning. We honestly thought she was a gonner, but then someone managed to pull her out. She was in a bad way though. The sea here is indeed dangerous for a variety of reasons. Firstly, the current is generally strong and the waves big. Secondly, there is an almost insurmountable under-current which tugs you down with unbelievable force. Thirdly, a big wave can come up and surprise you at virtually no notice – even if you’re on dry sand a couple of feet away. It’s no wonder your average BÃ©ninois is scared of water and won’t go near the sea! Mind you, that’s not to say you cannot enjoy a wee paddle in the shallow water, as long as you exercise extreme caution. Click here for the World Travel Guide info on Benin, which also mentions how dangerous the sea is. However, this article from Benintourism.com says how lovely Grand Popo is without even a mention of how dangerous the sea can be. Happy swimming – stay safe! 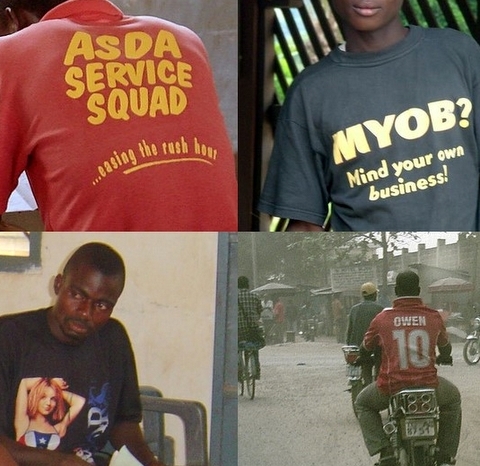 Many t-shirts from elsewhere in the world make it to West Africa, where they are sold at local markets. You may remember this occasion, where I saw a lady wearing a Newnham Middle School sweater at the market. Clothes like this are sent over from charity shops in huge bags, which market traders buy and then sell on the individual items. Once I bought a Marks and Spencer suit for 9,000 cfa (= Â£9-). I was delighted to see the old price label, still inside, which read: British Heart Foundation Â£10-. Wow – I saved a pound, even after its long journey here!!! 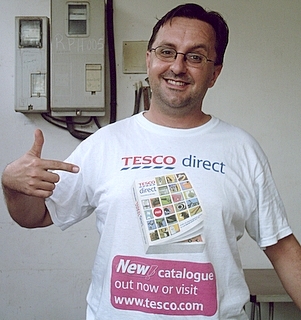 I couldn’t resist it – for nostalgic reasons – but somehow don’t think I’ll wear it back home! Q: On my iPod, I have the two greatest EVER renditions of the song Somewhere over the Rainbow. One is sung by a man, one by a woman. Both artists died in the late 1990’s, less than a year apart. They both came from somewhere in the USA. 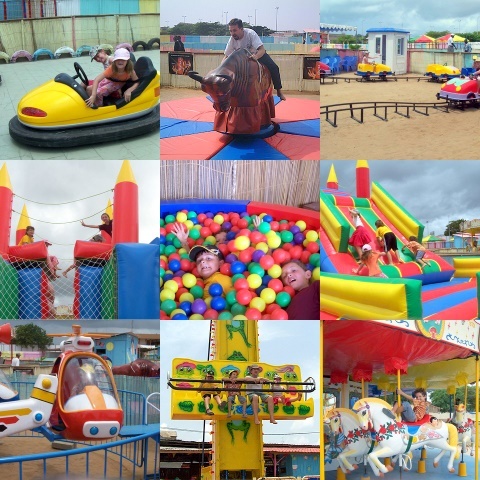 Merry-go-round, dodgems, flume ride, up-and-down-froggy ride, large bouncy castle, trampolines, mini roller-coaster, mini-helicopters, rodeo bull, ball pool and various electronic games. There’s also a small cafÃ© which does fairly edible pizzas and the like. There is a strict notice as you go into the park, saying: “For the well-being and education of our children, no smoking or alcoholic drinks are allowed in the park.” Good idea, but we did laugh when we noticed that the cafÃ© in the park actually sells beer!! 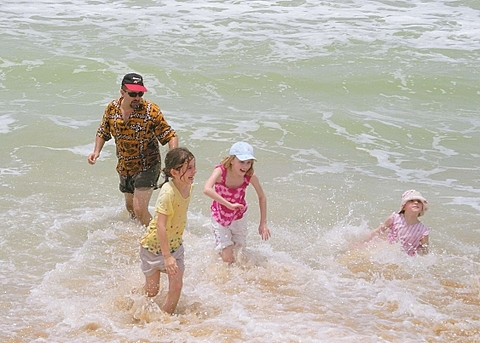 So…fed up of taking your kids to the beach or the pool? There’s now an alternative – Magic Land. Have fun!